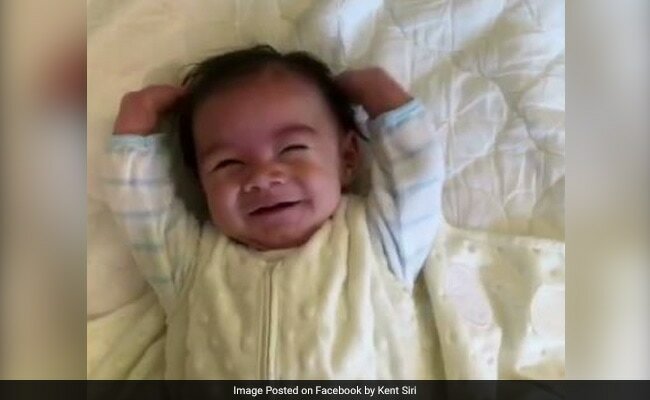 New Delhi: 5-month-old Kaden Patrick is internet's current fixation. The baby's morning ritual of stretching out his arms after he is unwrapped is something you must have seen on almost all social media platforms. According to CBS4, father Kent Siri noticed that Kaden would throw his arms as if they were spring-loaded every time he was unwrapped from his swaddle. He then started recording his son and edited a short video of him edited to Mel Gibson's famous 'freedom' speech from Braveheart as a joke to show to family. The family loved it and that's how it caught on. He saw an opportunity and seized it. Since then, he has uploaded several videos of Kaden kicking his hands edited to songs and movie clips - Beyonce's 'single ladies' and 'YMCA' by Village People being few. And it hit internet jackpot! Within a week, a supercut video of the baby's everyday routine has gone off the charts with over 11 million views. Kaden who now enjoys celebrity status on internet has his own Facebook and Instagram page. His father says they wanted to give him a 'space of his own' to post fun videos and photos of him growing up.